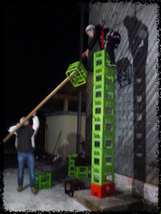 Equipped with a harness, participants will stack crates whilst trying to balance on top. In the safe hands of an experienced Guide, the climber will receive new crates from the other participants to build the crate-tower highers. Each teams counts the amount of boxes they manage to stack in the given time. This is a brilliant team-building experience, built on trust, communication and pushing your own limits.